Born and raised in Singapore, Sebastian desires to understand who he is in the rapidly changing country he calls home through images. Photography for him is a visual language, uninterrupted by words. Like how poetry use words to crave into the individual and demands for past experiences to be revisited for interpretation, great photography should invoke the same with light, shadows, geometry, gestures and emotion. It is an obsession. It is a way to understand society/himself and simultaneously making sense of it. As someone who educates for a living, he hopes to do the same by sharing his knowledge with the world as a guide to self-discovery through photography. 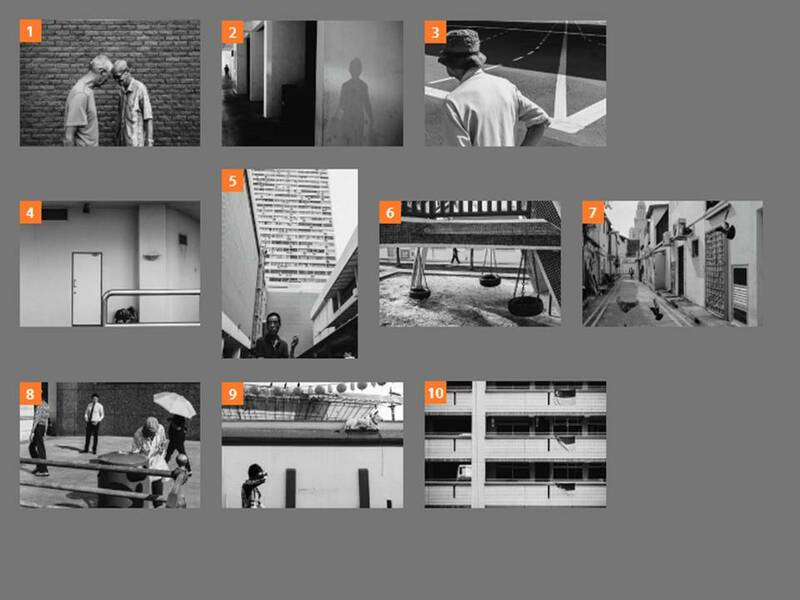 While he does not use likes on Instagram as a reference point for his work, he is honored that his major influences like David Alan Harvey, Fan Ho and contemporary photographers like Tavepong, Argus Paul have acknowledged his work through the social media platform. Hi Sebastian, thanks for submitting your series here. There is a quiet and an unsettling feeling to many of your images and the architecture and isolated individuals does speak of something being un said or out of place. It feels dystopian in some ways and I do see the text in these images. I like the way you are creating images that feel abstract even though the methods are very straight forward and simple in their execution. It reminds me of some of Jospeh Koudelka's work and also the work of the New Topographics photographers, Robert Adams and Lewis Baltz through the use of the black and white and the flat perspective in some of the images. For me, the work is stronger when you are finding scenes at eye level and when you do shoot quite flat. I find that these images accentuate the strong shapes and lines of the architecture against the subjects you find. In particular I am drawn to the landscape images and images 1,2,3,6,8 and 10. I think the framing is working best in landscape ration and this helps to highlight the subjects within the landscape. I do enjoy image 5 and I understand the relevance of the scene but I find the framing a little forced and unbalanced. I enjoy the images where they feel unplanned and more reactive but where there is balance and pace. Image 1 is abstract and I find myself questioning what is happening. It could be a Jeff Wall image and be completely controlled. It has that uncanny element that makes it unsettling. I think the theories around the idea of the uncanny landscape may be of interest for your practice. Image 3 is a wonderful composition and it works both as purely visual and as an image that is full of symbolism. All of the lines seem to be leading away from the elderly man. I really enjoy this. It is contrasted with the more playful image 6 which still has a loneliness to it though. The lack of children to play on the swings. Image 8 also has elements of Jeff Wall or Phillip Lorca Dicorcia. There is an epic quality to the way you find and record the quiet moments but they become monumental in some way and the lighting combines to make these small operas. The framing is really nice and the balance of figures combine to give contrast and drama. Image 10 does remind me of Lewis Baltz. Initially I wanted there to be a figure to break up the lines but I think this works as it is. For me, the work is strongest when it has the mixture of place and people but also the drama and the light to give them the cinematic feel that you have in many of these images and this is what I would try to develop further and build on. There is the room left for the viewer to project and to read and I think this is hard to achieve. To maintain the visual impact but not to be too literal and I think the balance is there in the images I have focussed on.